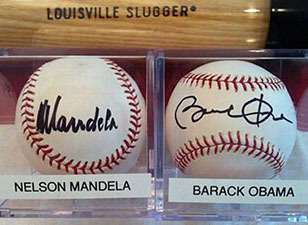 Back in 1999 – I jokingly said to my dear friend Congressman Greg Meeks (D-NY) that if he ever got a chance to take a Congressional junket over to South Africa – it would mean the world to me if you could ask Nelson Mandela to sign a baseball for my collection of signed baseballs from world leaders, which was in its infancy at the time. I had given him a few baseballs to keep in his offices in D.C and New York for the just in case encounter with a world leader. Fast forward to 2005 I get a phone call from Greg’s Chief of Staff who was very excited on the other end of the phone and barely able to tell me that the Congressman needed me to call him right away. I had a good feeling. Nelson Mandela had just made his last sojourn to the United States to meet with the Congressional Black Caucus in Washington, D.C. and Congressman Meeks was able to have Mr. Mandela sign my baseball at this meeting. The only caveat was that Mr. Mandela said in that authoritative voice to Mr. Meeks, “I better not see this for sale on ebay!” I could not believe it when I spoke with the Congressman and he told me of this great achievement. To this day – it is among my favorites in my collection and probably one of the most sought after signatures of the 20th Century.